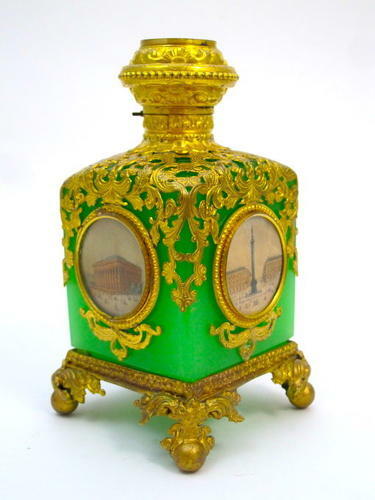 The Lid has a Fine Miniature Depicting a Miniature of Paris. The Main Body of the Perfume Bottle is Mounted with 4 Miniature Rosettes of Parisian Monuments including Notre Dame and La Madeleine. Beautiful Fine Dore Bronze Lattice Work and it Rests on 4 Scroll Feet.